Your dashboard is a great way to get an overview of all the domains you’re tracking and how they’re performing on Google, Yahoo! and Bing. 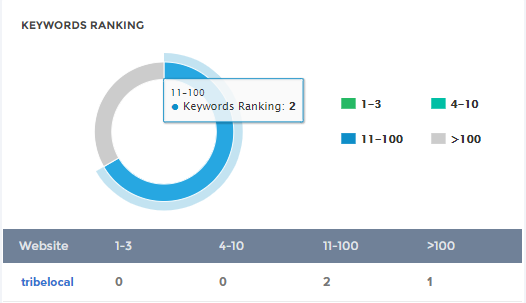 When viewing your dashboard, the small graph at the top of the page shows the average rank for all keywords being tracked in each domain as well as the average change in rank for that specific keyword set on each respective search engine. How is this data useful? Your dashboard can tell you, at a glance, various information such as increases or decreases in average rank for keywords within a domain, how your website is doing on Google vs. other search engines, how you rank on average compared to your competitors (if they’ve been added to your account), and how your international sites rank. See the average rank, local rank, and rating of your and your competitor in all the search engines. If the average rank is anything greater than 100 it shows >100. - The chosen website doesn't have any ratings to show. For a given keyword, the page in which your domain ranks in the results page of search engines is keyword ranking. For example, consider the image below, the keyword position of the website, TribeLocal, which was found in the range of 11 to 100 pages is 2. As no keywords ranked in the range of 1-3 and 4-10, they are not shown in the circle. 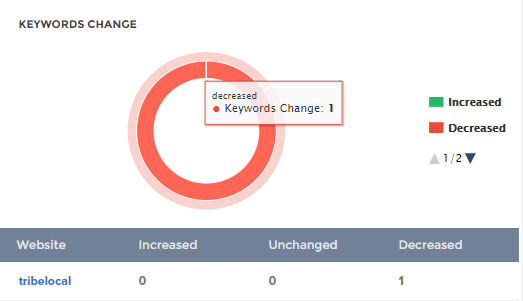 See the change in the position of your keywords, whether increased, decreased or unchanged. So that you can concentrate on the keywords which need your attention.